Welcome to Highlander German Shepherds. 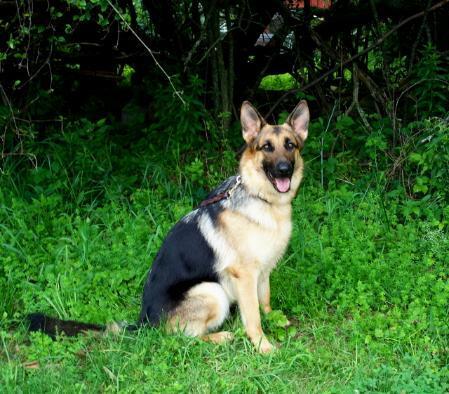 We are a small hobby breeder that is dedicated to the betterment of the German Shepherd breed. Our dogs are working service and therapy dogs with spectacular pedigrees comprised of World Sieger Champions. Highlander German Shepherd dogs and puppies are very special members of our family. They have been carefully chosen for temperament, health, and type from the finest West German bloodlines. A joy to live with and love, they have been lovingly nurtured in our home which has made them very confident and social. Highlander German Shepherd puppies are raised in our home as a part of our family. Human imprinting starts literally from birth. They go out into the world loving people confidently and easily embedding themselves in their new family’s hearts. Our home and lives are built around our dogs that are carefully monitored in every way. We have 45 plus years of experience with German Shepherds that includes Police K9, narcotic detection, search and rescue, advanced obedience, personal protection, animal assisted therapy, service dog training/handling, as well as loving family companion dogs. We are extremely proud of our dogs and love them more than words can say, they are a vital part of our lives. We do not mass produce puppies. Having a few (2) select litters per year enables us to give each puppy individual attention, human imprinting, and socialization. A tremendous amount of thought and consideration on our part is done prior to placing a puppy with a family. Placing our puppies is an adoption process and a great responsibility. We will personally meet with you to see if one of our puppies is a good match for your family. If we feel that that match just isn’t there your deposit will be refunded in full. Our commitment to our puppies does not stop at the adoption but continues throughout their life, as we strive to be available at any time to the adoptive families to assist them in achieving the best relationship between them and their newest family member. Highlander German Shepherds is a family run breeding program that is comprised of myself (Alisia) and my parents: Tom & Lorraine. This is not a business but rather a labor of love, belief in, and dedication to the fabulous German Shepherd breed. My dad knew what he saw in Satan’s eyes … “A Reason To Believe.” That day changed both of their lives for the better as my father believed in Satan when nobody else did. Satan was not ferocious unfortunately up until that point he had never been loved or cared for. Prior to being donated to the canine unit he suffered from inexcusable medical neglect and physical abuse. All Satan needed was love and medical attention that my family provided without hesitation. Satan responded immediately to his new loving family and medical treatment. So much so that he became a phenomenal family companion and one of the very best police dogs in the region. Satan was highly recognized and honored for having the highest number of narcotic detections and successful search and rescues in the history of the department. Satan retired from police work when my Dad became a Detective and lived out his life with us despite the fact that the very people who planned to destroy him requested that my Dad donate him back to them as he was such an extraordinary police dog. Of course Satan stayed with us …. family is family! When we were in the dreaming phase of what was to become Highlander German Shepherds – Satan was what we had in mind. He represented the ideal German Shepherd. He was extremely well rounded, possessed unmatched intelligence, devotion, love, drive in all respects, strength, confirmation, agility, etc. That type of well rounded German Shepherd is what we are all about – a reason to believe. All of our dogs are trained for real life situations and are loving family companions. They work as therapy and service dogs, are trained in advanced obedience, tracking, and personal protection among other things.